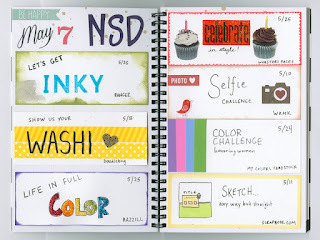 One of the NSD contests at Scrapbook.com was to decorate a planner page. 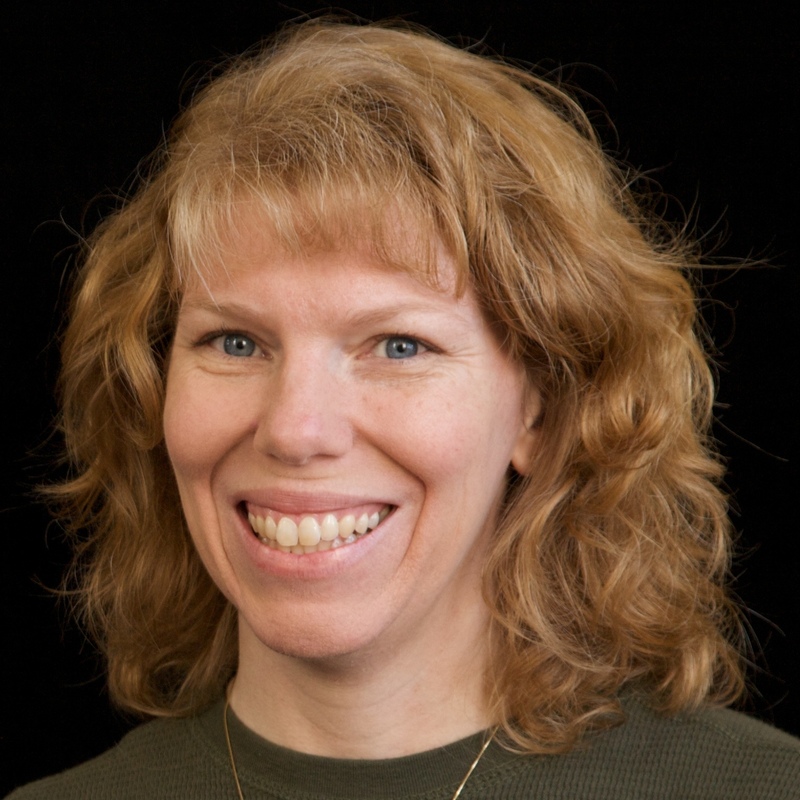 They listed several suggestions, including creating a NSD to-do list. I've never done a planner page before and since I needed to make a list of the challenges I was doing anyway, it made sense to do it planner-style and enter the contest! Simple Stories (probably my #1 favorite manufacturer) donated the prizes and they look great. Can't win if you don't enter, right? Let's Get Inky: I stamped the word INKY in blue, inked the edges in green, then added silver Smooch ink and smeared it. Show Us Your Washi: I wrapped yellow washi around the card, then punched a heart from black washi to use as an accent. Life in Full Color: I filled in the letters of COLOR with Stickles in rainbow order. I inked the edges in purple, since COLOR only has five letters. Celebrate in Style: I added orange Stickles to a 'celebrate' sticker and paired it with two cupcake stickers, then drew a scalloped border in orange. Selfie Challenge: I decorated this card with photo-related stickers, then lightly inked the edges. Color Challenge: I dug through all my cardstock scraps to find near-perfect matches of the colors for the challenge. Sketch Anyway But Straight: I drew the original sketch on the card to use as a reminder while creating, then edged the card in yellow. 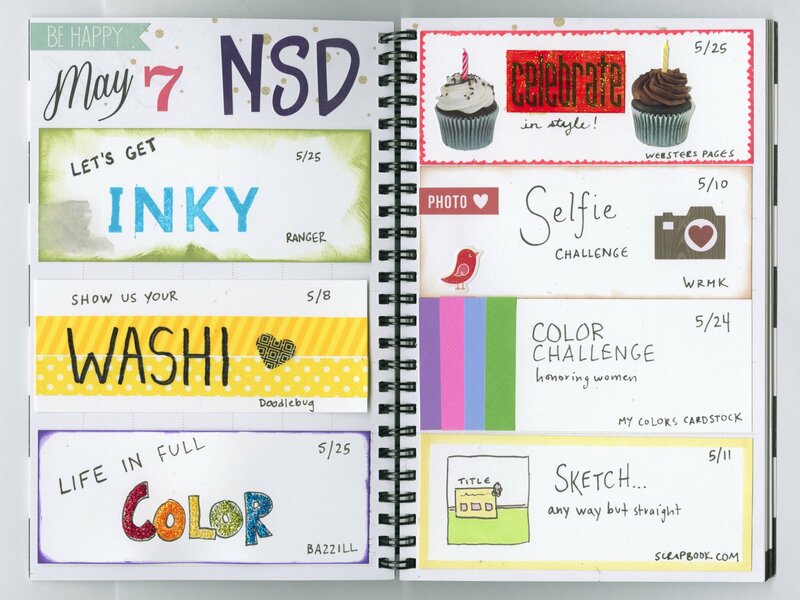 I glued the seven cards onto the planner, then added the stickers: 7, NSD and BE HAPPY. I love how it turned out. And even better, it was very helpful for staying organized. I'll be doing this again in future years. I actually made a card for the planner challenge too, but decided it made no sense to put it in the planner (I plan to do something I'm in the process of doing... No.) so I left it out. Over the next few weeks, I'll show you everything else I made during National Scrapbook Day. Super cute - I'm anxious to see what you came up with for each of these. Nice! I haven't done a planner page before, but challenges are sure good for that.